A small nursery in the village of Fuoni, pronounced An – na – Ba – wee –yah, built in 2012 by Ms Asia Issa Jecha and Mr Hassan Mwinyi kombo as part of a women’s project. The school is run by 6 local teachers who devote their time from 07:30 in the morning to 12:00pm, five days a week, in order to help educate the young local children. 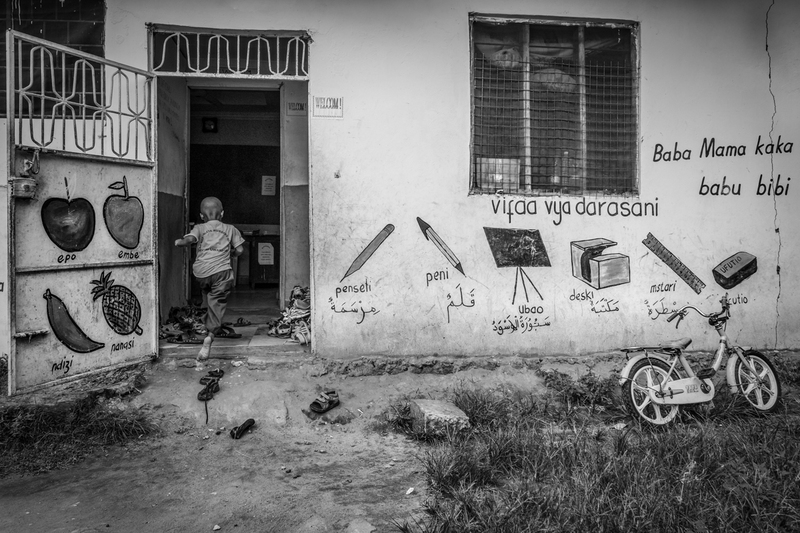 The school initially had 93 students and now have at least 100 local children who attend the nursery for free. The nursery building is also used from 19:00 to 20:00 for private tuition classes; these are held by different teachers. 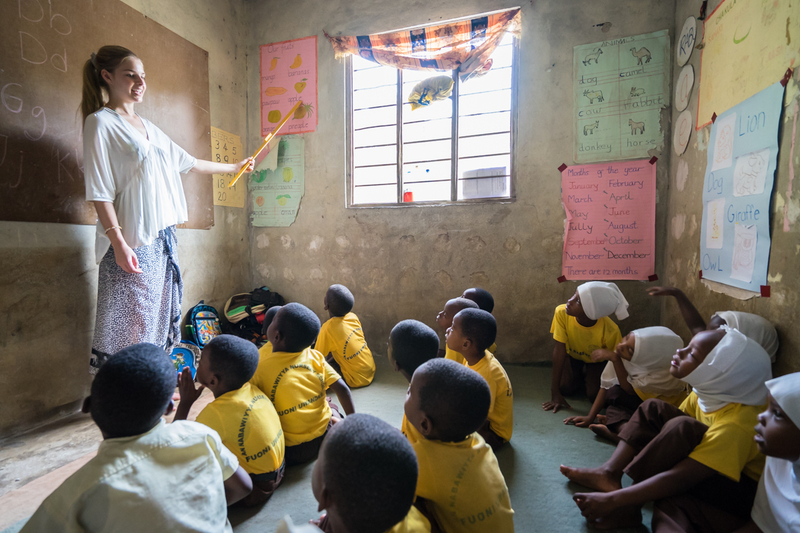 The children learn English, Maths, Science, Swahili, Arabic, Art and Religious Studies. 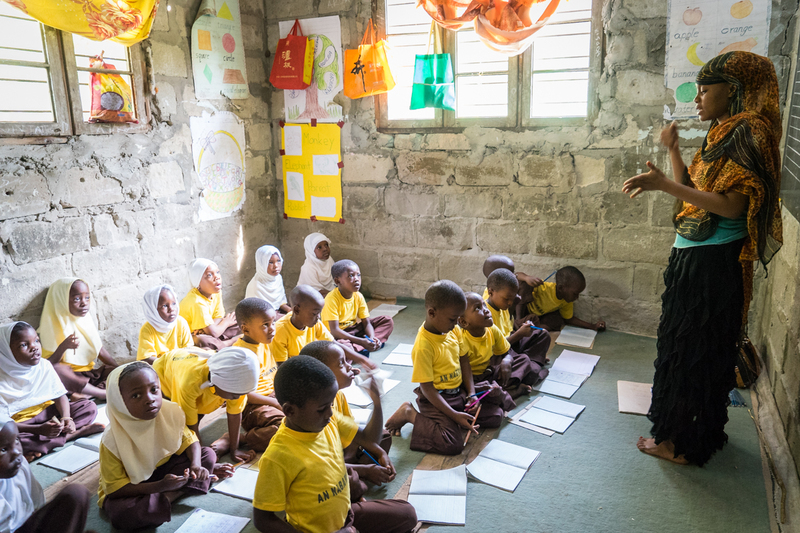 Art in Tanzania have been involved with the nursery since 2014 and have provided a total number of 10 volunteers who have helped teach the children and also assisted the local teachers, by, for example, providing them with one to one English lessons. The first day we visited the nursery was to deliver four benches that were kindly donated by a former Swedish volunteer; altogether there are four classrooms, however, all four of the benches were placed in one classroom. The aim is to fill all four classrooms with these little benches so that all of the children can benefit and enjoy learning in a comfortable environment. All the children wanted to sit on them and were extremely excited and happy with the generous donation. When we went to visit the nursery again, we spoke to the head teacher, Mrs Latifa Mahfoudh, a stunning and pleasant woman who you could see loved working with the children and had always had a passion for teaching; we sat down and had a long chat at about the nursery and what her ambitions were for the nursery and its students. Latifa pointed out some of the improvements to the actual building that needed to be carried out; a new roof was needed as the current one leaked, new windows were needed as well as a more stable and safer wall/fence around the parameters of the school with a gate, in order to keep the children safe and protected. Two of the classrooms were not plastered so it was impossible to provide a more pleasant environment for the children to learn in, as you can see from the pictures, the classrooms were dark and unpleasant, even with the sun blazing outside. The nursery also needed to build new toilets for the little boys and girls to use. As well as the children’s facilities, Latifa showed us her own office, which really does need some attention, it would help her to have a proper carpet that covered all of the floor, new stable chairs and shelves so that when volunteers or guests come, they too can use the office and have a pleasant and clean workspace to work in, without feeling your chair is going to giveaway any second! Latifa would also like to go on computer courses and get computer for her office to make her work easier. Upon our return, three volunteers, Louise Proctor, Claire Manning and Elizabeth Drey flew out to Zanzibar from Ireland and brought with them a very generous donation of over £4000 for the nursery; with their help and local workers, building work has now commenced, with a new roof and plastering. The work on the wall/fence will be started next, and then the new windows will be fitted. The donations will also help to build new toilets for the little boys and girls. A further £3296 has been donated by Whitney Harris-Linton from Michigan (£77 put towards the roof), Melissa Wolsley from Findlay, Australia (donated £99 for a black board to be fitted in the classroom) £2600 and £520 have also been donated from more kind donators. The money given will be used to finish renovating the school and any money left over will be used on a new project in Madale, Dar-Es-Salam, subject to the donors consent. If you would like to volunteer at the nursery or donate; your time, skills, money, toys, stationary or school equipment, do contact Edward Busungu at Art in Tanzania and get involved, it certainly is a fantastic project and the children and staff are simply delightful to be around. If you do wish to teach at the school, we would recommend spending more than two weeks, as this will enable you to build a much better rapport with the children and staff, allowing them to put into practice what you teach and you will be able to witness the difference that your presence can make in their lives and futures.